After all the foreclosures, evictions and Wayne County auctions, 52% of Detroiters are now renters. City-wide rents have risen about 25%, now averaging $800 a month while downtown rents for studio apartments start around $1400. With more than a third of Detroiters living at or below the official poverty line, finding a place to live has become increasingly difficult. The Urban Institute revealed that nearly 60% of Detroit renters are considered “rent burdened,” meaning they spend more than 30% of their income on housing. What is the Area Median Income? Usually the area is defined as Metro Detroit, where the AMI is $48,000 for a single person, but for Detroiters it is only $28,000—a 71% difference! Public Housing: These are units run by the Detroit Housing Commission. But there are only 3,340 of them and they have an occupancy rate of 95%. The waiting list, which is currently closed, contains 5,760 applications. Housing Vouchers: These Section 8 vouchers are a rental subsidy that can be applied to any unit where the landlord is willing to accept it. Nationally 2.2 million Section 8 vouchers have been issued. The problem is that 65% of the time landlords turn people with vouchers away so even with a voucher, a low-income individual or family may not be able to find a safe, affordable housing. The Detroit Free Press stated that as of April 2018 only 140 vouchers had been issued in the city. The waiting list for the program, with 6,000 names, has been closed since April 2014. Affordable Housing: These are units built through the Low-Income Housing Tax Credit (LIHTC), which provides developers with tax subsidies in exchange for having a certain number of “affordable” units. After 15 years the building’s owner can exit the program by applying to state officials. “Saving Decent Affordable Housing in Detroit,” a study by the University of Michigan reports that between 2016 and 2022 approximately 7,000 homes and apartments under LIHTC will pass the 15-year mark. Since the 1970s, using HUD money and LIHTC, three million affordable housing units have been built. Yet since 1995 over 350,000 of them have been turned into market rate units. The National Low Income Housing Coalition estimates that 15,000 affordable units are lost each year. The reality is that low-income options aren’t very available. 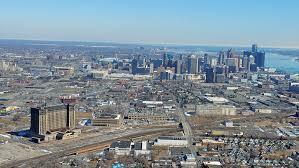 For Detroit are contracting, particularly in downtown buildings. In March 2013 management the 1214 Griswold building informed more than 100 low-income seniors, many with disabilities, that they had a year’s notice (as is necessary under the Section 8 program) to move as the building would be renovated. See Kate Levy’s documentary about senior citizens living in downtown Detroit and then scroll down to the 12-minute video, “Holding Down the Fort.” Today the building, now called The Albert, is a luxury apartment building. But as the Levy documentary notes, there are 2,000 more senior citizens living in downtown apartments and may face displacement. The latest displacement is at the Park Avenue House, 180-unit downtown hotel, which was recently sold and will be remodeled. It was one of the few long-term affordable hotels to live in downtown area. Residents were initially given a 30-day notice. After a great deal of negative publicity — and after a maintenance man was to remove all hotel-owned appliances (microwaves and refrigerators) from the rooms — the City of Detroit sent a cease and desist letter and an agreement was worked out to allow the residents to stay until next June. Starting in 2019 United Community Housing Coalition, which has a low-income housing placement program for Detroiters, will lose 90% of its placement funding. The City of Detroit has responded to this crisis of affordability by announcing a fundraising campaign to raise $250 million to rescue 10,000 set-to-expire units and create an additional 2,000. Reviewing the limited options for affordable housing, you can see how these programs cater to real estate developers and landlords rather than to the low-income population that needs safe and affordable housing. Hold landlords accountable for decent housing conditions. Oppose people being kicked out of their homes. 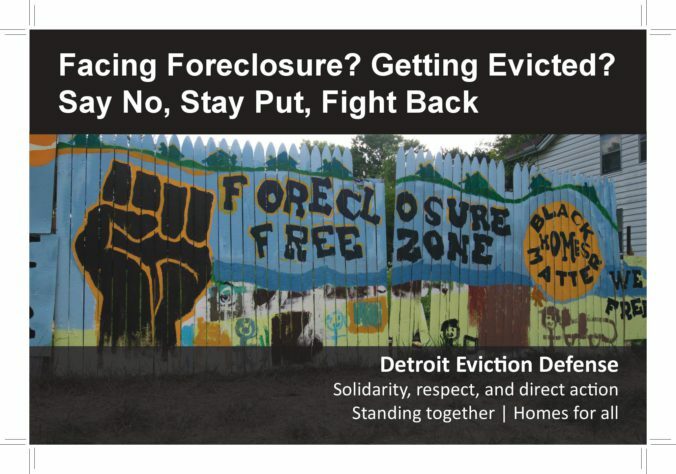 We encourage people in the process of being displaced to reach out to Detroit Eviction Defense, to their fellow tenants, neighbors and to the community at large for help. If you belong to a union or to a church/synagogue/mosque, be sure to let your brothers and sisters know you or your friend need their help. Oppose a reduction in integrated public housing. Demand that “affordability” be defined as 30% of one’s income. Support housing as a human right.